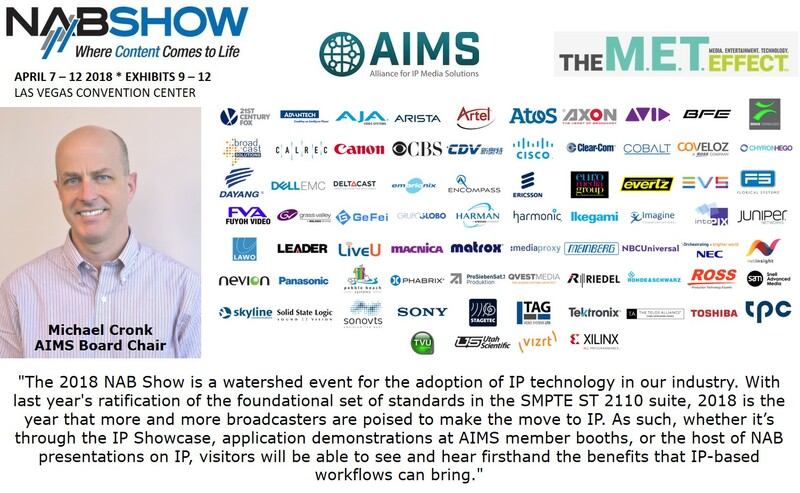 To demonstrate the real-world power of IP, the AIMS IP Showcase booth will feature an all IP-production room. Broadcasting live during show hours, the broadcast control room will use all-IP technologies to show how end-to-end productions are possible using the standards and specifications promoted by AIMS. The all-IP broadcasts will also make it possible for those not visiting NAB to see IP Showcase Theater presentations streamed live over the internet. Get the actual picture in 11 Days at this years NAB Show: This vast and comprehensive show floor showcases the latest game-changing tech, craft-altering trends and cutting-edge tools that change how we create, manage, deliver, consume and monetize content, no matter the purpose, no matter the screen. As of today we feature 54 companies and their approach at the NAB2018 Show. This list is continously updated. NAB2018 opens on 07April at the Las Vegas Convention Center. Guangxi TV, a leading TV channel focusing on content about fashion and entertainment, strives to show the beautiful world to viewers. It delivers a range of hunky programmes including "Fashion China", "Beautiful Guangxi", "Find Jinhua" and "Collector Ma Weidu" that are made to introduce Guangxi's beautiful sceneries, dazzling ethnic culture and follow the fashion tendency. Thanks to the star power brought by the host and the appearance of the star guests, “Talk with Zhao”, a celebrity talk show hosted by Zhao Zhongxiang has attracted overwhelming attention from viewers. NEP chose the CyanView solution to support its coverage of sport – notably ice hockey and basketball – to enable it to deploy mini-cameras in any location (for example, on a basketball backboard to capture the ball passing through the hoop). The CyanView solution fulfills the vision engineer’s requirement for full camera control, including advanced colour correction. “NEP has become a pre-eminent provider of outside broadcast, live events and remote production companies for many reasons – and among those is our constant innovation, helping our customers deliver content that is engaging and compelling and, often, unique,” said Zlatan Gavran, Managing Director of NEP Germany GmbH. As one of the world’s most renowned games developers, with titles including Street Fighter, Resident Evil and Monster Hunter in its catalogue, Japan’s Capcom is also a leader in the specialised field of games audio. More than 300 Genelec monitors can be found within the company’s facilities, and a recent refurbishment of Studio B, within the nearby “bit MASTER studio” R&D location, has prompted the addition of even more. Now renamed the Dynamic Mixing Stage, the room has become home to an immersive 7.1.4 set-up which represents Japan’s most prestigious installation to date of the coaxial 8331 and 8341 point source monitors from The Ones range. Starwest Studios, an all-new broadcast production and dance facility in Burbank, California, is also an outstanding showcase studio for Litepanels® LED lighting solutions. An array of almost 50 lights from Litepanels’ Gemini, Astra, and Sola, product families provide reliable, flicker-free lighting for a wide variety of television broadcast and online streaming dance productions. Launched last fall with partner Randy Jackson, former “American Idol” judge and well-known producer, Starwest Studios is the world’s first dance studio and broadcast production facility, with spaces for both music and video production. The CrossFit Games are the world's premier test to find the Fittest on Earth. The athletes at the Games are challenged with elements such as weightlifting, gymnastics and endurance, as well as tests unknown to them until just before the competition begins. The CrossFit Games Open—the first stage in the CrossFit Games season—was introduced in 2011. The Open is an online, all-inclusive event in which CrossFit casts the widest net possible in the quest to find the fittest on earth. More than 380,000 athletes competed in the 2017 Reebok CrossFit Games Open. Now in its seventh year, the Open has grown exponentially in both number of athletes who compete, and number of viewers who tune in to watch the live announcements of the five workouts that make up the worldwide competition. Blackmagic Design announced that IMAG projection for the 2018 X Factor live arena tour was produced with a PPU, built around an ATEM 2 M/E Production Studio 4K with ATEM 2 M/E Broadcast Panel. Live acquisition was delivered by an HD multicam set up which included the URSA Broadcast. The tour, produced by live specialist, PRG XL Video, took the talent show’s winners to 15 cities across the UK in just three weeks. Vis a Vis Video’s Stuart Merser led on all video production for the tour and collaborated with X Factor’s studio director, Diccon Ramsey, to ensure the live set up matched the format and feel of the popular television series. HSL is delighted to be on the road again as lighting suppliers with Scottish rockers Simple Minds and their long time lighting designer Stephen Pollard who has created another innovative look for the band’s acclaimed new “Walk Between Worlds” album. Released in February as part of a celebration of an incredible 40 year career, the album is a blend of the introspective yet optimistic elements of their music with some huge electronic and stadium rock moments that kept them on the ‘alternative’ side of cool. The performance features the entire new album, bookended by a careful selection of Simple Minds early material and classics. Multi award-winning rental and production specialist Adlib is delighted to be back on the road again with Irish rockers The Script, supplying an amazing sounding CODA audio system for FOH engineer Steve “Pato” Pattison. He and monitor guru Marc Peers are also both well-known and talented Adlib regulars who have worked on previous Script tours, and are both assuming engineering roles for the first time. Adlib has provided audio for The Script’s four previous album campaigns which has included three arena tours and some stadium shows. Long term FOH engineer Richy Nicholson has actually flipped roles on this one, after many years of mixing FOH, he’s representing Adlib as the account handler, co-ordinating everything from the office and warehouse perspectives.